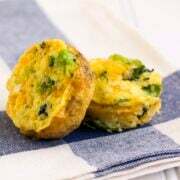 Mini Broccoli Cheddar Frittatas are the perfect portable and healthy breakfast, especially for those crazy back to school days! Preheat oven to 350 degrees. Spray a standard 12-cup muffin tin with cooking spray or fill with baking cups. In a mixing bowl, whisk the eggs together. Add the steamed and chopped broccoli, shredded cheese, sliced onions, salt and pepper to taste. Mix to combine. Fill the muffin cups with the egg mixture. Bake for 12 minutes, until the frittatas are firm. Note: To steam the broccoli, bring an inch of water to a boil in a medium saucepan fitted with a steamer basket (if you don't have a steamer basket you can use a fine sieve or just place the broccoli in the water). Cut off and discard the stalk and rinse the broccoli bunch with water. Place broccoli in steamer basket, cover, and steam on medium heat for 5 minutes, until crisp-tender. Don't overcook.